The documentary avoids a dry recounting of people and events, but over-compensates with assumed psychological insights. John Kennedy was shot down in Dallas a very long 46 years ago, and it remains a controversial event in American history. The Kennedy Assassination: 24 Hours After does not broach the controversy, at least not the one most people recognize. The documentary reports the official Warren Commission version of the shooting as fact, albeit within a narrative more concerned with the presidential transfer of power that day than the mechanics of what transpired as the shots rang out. The lead character in this story is not JFK, but Lyndon Johnson. 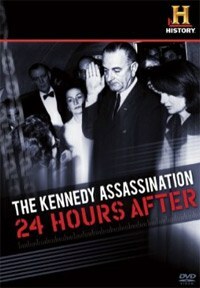 The Kennedy Assassination: 24 Hours After (appearing in conjunction with Stephen M. Gillon's book of the same title) utilizes recently released interview transcripts compiled by William Manchester for his 1967 book The Death of a President. These recollections, from people directly involved in the transpiring events, add verisimilitude to a linear narrative which follows the presidential party as it travels from Love Field through Dallas to Parkland Hospital, and then back to Air Force One and on to Washington. Gillon and several other narrators, mostly academic historians, avoid a dry recounting of people and events, but over-compensate in presenting a rather curious mix of breathless contemporizing, pop psychology and tenuous dissentions. The narration too often purports psychological insight to response and motivation, assumptions which may or may not be accurate. This is particularly acute during several possibly exaggerated episodes played as high drama, even as the film provides information to undercut the contention. Much is made, for example, of Lyndon Johnson being kept out of the loop as to the extent of Kennedy's injuries, despite being informed within moments of arrival at Parkland Hospital that the situation was grave. Johnson's "paranoia" over being "kept in the dark" leads to his insistence that he be informed of Kennedy's death directly from JFK's chief of staff. The time this takes becomes, in the film, an exposure to serious vulnerability for a United States without an official "Commander-In-Chief". Stock footage of a ranting Castro and marching Soviet troops fill the screen, although in actuality the military was quickly on high alert and there were no adversarial movements of note. A dispute between Johnson and Robert Kennedy over the oath of office achieves epic stature -- was RFK plotting to deny LBJ the presidency? -- before, late in the film, it's agreed it was more likely a misunderstanding. The procedures for presidential succession are very clear, so how or why either of these senior officials would entertain an alternate notion is not broached by the historical experts (as far as we know there was not an 'Alexander Haig moment' that day). Similarly, Robert Kennedy's rushing to his brother's casket after Air Force One touched down in Washington -- and either not seeing or not acknowledging Johnson -- gets played as a major snub, a willful refusal "that just drove Johnson nuts". But we had also been informed that Johnson overruled the Kennedy family's wishes and okayed the presence of live television cameras at the airport, and so RFK's motivations may have been more concerned with family dignity than political machinations. I don't really know one way or the other, but neither, probably, do the on-camera experts, although this doesn't stop one from opining "It was really the Kennedy people who were putting personal motives above what might be the good of the nation". This narration integrates with an edit alternating newsreel footage with cutaways of fragmented recreations and point-of-view location footage, punctuated by simple visual motifs: blood-stained white glove on a hospital gurney, simple metal chair outside of trauma room, bronze casket, and so on. The Kennedy Assassination: 24 Hours After is effective in establishing a you-are-there framework, placing the viewer in the midst of events at once dramatic, traumatic, and of conscious historic import. The film moves at a steady pace, balanced by appropriate time-outs to linger on a poignant moment or a brief contextualization. The hyperbole over the (non)contentious episodes always serves to heighten the drama, which makes decent television if flawed historic analysis. The filmmakers, then, are not naïve, but seem to have hatched a deliberately unsophisticated approach to events based on potentially misguided psychological assumptions, thereby reducing complex political intersections to petty personality conflicts. Lyndon Johnson, on the eve of the Texas trip, is described as facing a political career that was effectively "finished". This is attributed to animosity between himself and the Kennedys, and their attempts to neuter the effectiveness of his office. While those points are true, it could also be pointed out that Johnson's political career was in serious trouble because a high-level Senate investigation was implicating close associates of his in a major corruption scandal (the investigation was suspended after the assassination and not picked up again until 1969). The Kennedy Assassination: 24 Hours After foregrounds the supposed ego conflicts, and leaves out the political conflicts grinding away at a more material level. Also left out of The Kennedy Assassination: 24 Hours After is that the perpetrator(s) of the assassination itself remains highly controversial. Lone gunmen advocates can point to Vincent Bugliosi’s recent and massive Reclaiming History as the latest final word in defense of the Warren Commission. Critics of the official version can in turn offer James DiEugenio’s detailed critique/rebuttal to Bugliosi’s book, or ambitious revisionist histories like James Douglass' JFK And the Unspeakable. The many questions surrounding the homicide investigation and autopsy, and numerous other issues, ensure the debate as to who did it and why will continue for the foreseeable future. The DVD is packaged as a simple presentation of the original History Channel broadcast, with a menu selection of 12 chapters.